There is no question that vaccines save lives, but there is also compelling evidence that implicates vaccines in not just triggering various immune-mediated and other chronic disorders, known as vaccinosis, but also injection site sarcomas. Thankfully, new vaccine guidelines have reduced the recommended frequency of vaccinations for cats, and many cat guardians are choosing to forego even the recommended three-year intervals for most vaccines by choosing titer testing instead. Almost all municipalities in the United States require rabies vaccinations for all cats, regardless of whether they’re indoor or outdoor cats. I’m not aware of any municipalities that accept rabies titers in lieu of a vaccine. The required frequency of rabies vaccines is set by local jurisdictions, and doesn’t appear to have much to do with the actual immunity duration of the vaccine. The Rabies Challenge Fund is hoping to change this by determining the true duration of immunity conveyed by rabies vaccines. The fund’s goal is to extend the required interval for rabies boosters to 5 and then to 7 years. The fund’s testing is currently only performed for dogs, but hopefully, they will also cover cats in the future. Adjuvants are substances that are added to vaccines to alert the immune system that an antigen is present. They increase the immune response. Unfortunately, these adjuvants can also cause aggressive tumors at the injection site. Do not assume that your vet is using non-adjuvanted vaccines – ask before you allow any vaccine to be given to your cat. For, Dr. Lisa Pierson, the founder of Catinfo.org, a website featuring a wealth of information on feline health and nutrition, the choice is clear: “I will be using/recommending the PureVax 3-year product going forward.” Click here to read Dr. Pierson’s detailed explanation as to why she believes this is the right choice. Educate yourself about the benefits and risks of vaccines, and discuss your cat’s vaccination needs with your veterinarian. 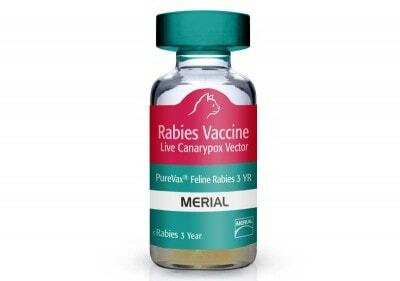 All vaccination protocols should be tailored to each cat’s individual health and lifestyle needs. Less frequent vaccinations do not reduce the need for annual or bi-annual physical exams for all cats. My cat is 2 yrs old and had his first rabies vaccination at 1 yr old. He had a reaction to it. A lump the size of an almond appeared at the vaccination site. I had just lost my other cat to FIP so after 3 mos. I had the mass biopsied. It was fine. Now he’s due for his rabies and I’m not sure what to do. My vet suggested the 3-yr vaccine. Please comment if you can tell me what you would do. Thank you! I would follow your vet’s advice, Maureen. The thinking seems to be that fewer injections (once every three years as opposed to once a year), even with higher antigen load of the 3-year-vaccine, may be preferable. Please contact your veterinarian, or Merial, the maker of the vaccine. They will be able to confirm that the 3-year vaccine does, indeed, have a higher antigen load than the 1-year version. Ingrid – What are your thoughts about the 3 year now that it has been out awhile? The fact that you can now vaccinate cats once every three years with a nonadjuvanted vaccine and still be within the vaccine guidelines seems like a win/win situation to me. It’s only been out since last fall, Anne, and I’m still not entirely sure about it. I’m concerned about the higher antigen load, and I’m not sure whether that cancels out the need for less frequent vaccinations. I think I’ll be more comfortable after there’s a full year of data available from people who have used it. This seems like an excuse. Everyone knows that Merial 3-year product is exactly the same Purevax vaccine as one year product but with different licensing. It’s clear from NIH article showing that the Purevax immunity lasts over 3 years, it’s clear from the UK articles. Merial didn’t use “different technology” or anything different in 3-year vaccine they just proved that the immunity lasts for over 3 years. So saying how “I’ll wait and see if it’s safe” seems to me a vet’s excuse to continue giving yearly boosters. The antigen load in the new 3-year product is higher than in the one year product, Kitty. While the antigen load is higher in the 3 yr. vaccine, the total is lower than 3 individual yearly vaccine doses. If the cat gets it all at once, that is what counts – that is the ill effect…. we have to fight for titer tests…. The antigen may be higher – I heard from other vets it’s not clear since Merial doesn’t really tell it, the 3-year vaccine has been available in the UK since 2012. The press release from the UK in 2012 (cannot find the link now) seemed to imply it was a change in the interval rather than formulation. At any rate, now is 2015, it’ll be nice to see more US vets starting to use it. Mine is like you – still waiting. I certainly hope by next year, they switch to it. I mentioned this to my vet a couple of weeks ago and he hadn’t heard of it yet.. It just came out and there hasn’t been a whole lot of communication about it, Connie. Thank you for this information. I didn’t know there were different types of rabies vaccines. My babies got their 3-year vaccines this year, so they won’t need them for a while. I hope by that time, there will be safer vaccinations available for kitties. I insisted on the Merial when Mollie had to get vaccinated prior to her dental. My vet told me that the 3-year had just been released, and he too would hold off. He also said it was about three times as expensive. As Dodds’ study has show, the actual duration is lots longer than the label! It is more expensive, Sally, but my main concern is the higher antigen load. If it wasn’t for that, I think the extra expense would be worth it. Thank you for keeping us updated on the vaccines. It’s very helpful.